I have salmon in my freezer right now...thanks for almost making my dinner. I am totally making this! Thx! Mmmm this looks like a salmon dish I might actually like..... Just may give it a shot! yes, I might actually have to try this! I, myself, am a salmon hater. The sauce sounds amazing though so I'll try it on some tilapia or mahi! Yum! 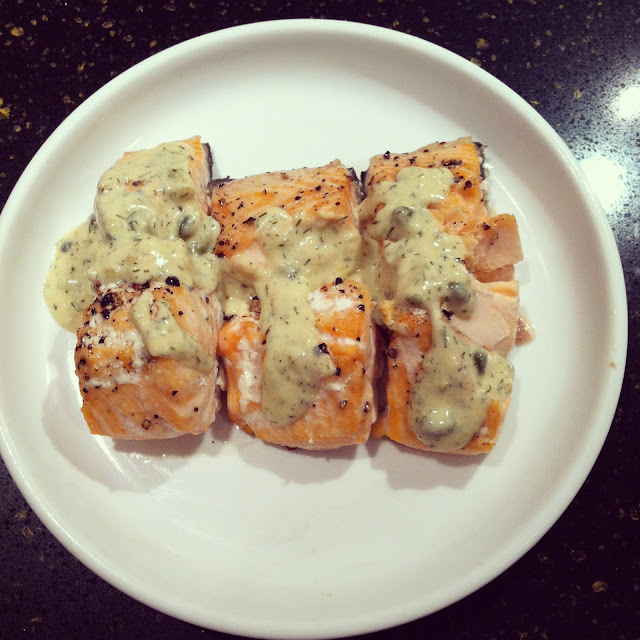 I LOVE salmon and I am always looking for new ways to make it. I am making this asap. Sounds delish! I wish I could get Eric to eat it! This looks so good..I love all fish! Looks like it would be a great and easy dish for a dinner party too. Love all your fall clothes - and that sunburst mirror in your hall!